We work with schools to deliver innovative resources, approaches, assemblies, training and workshops that engage pupils to think about the importance of equality and diversity in their school environment, their local communities and in wider society. We deliver a range of current and relevant assemblies, training and workshops to schools; these workshops cover topics such as LGBT History, Anti-Bullying and Personal Relationships. These workshops have been successfully delivered in secondary schools with excellent feedback. They are interactive, engaging and encourage effective thinking and learning. 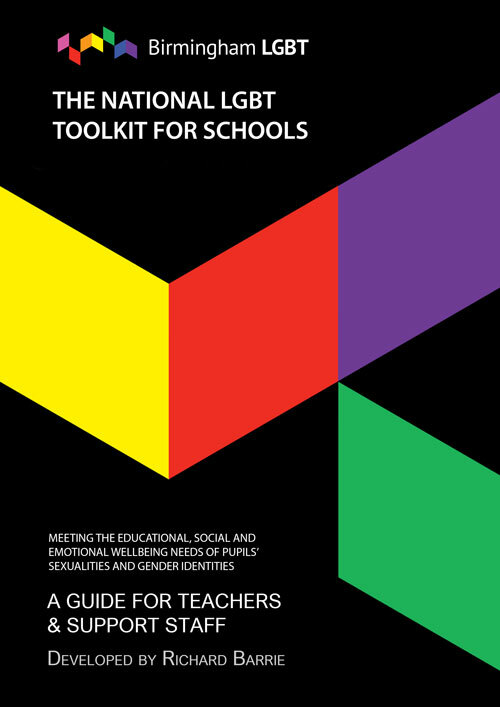 We also have toolkits and lessons for you to download. Since the repeal of Section 28 of the Local Government Act 1988, many schools now proudly teach about Lesbian, Gay, Bisexual, Trans* cultures and histories, but there is still a way to go. There is still a lot of work to be done by schools to protect and celebrate the rights of Lesbian, Gay, Bisexual, Trans* staff and pupils. Schools must consider the very structures that cause emotional harm to Lesbian, Gay, Bisexual, Trans* and Sexually Questioning pupils. It is these very structures that cause barriers to learning, barriers to achievement and barriers to making a positive contribution to society for LGBTQ pupils. Schools must be active in their responsibilities to take down these barriers so that these pupils can leave school as confident and responsible citizens who can go out and make a positive impact in society. Schools must consider the structures that cause different types of bullying, harassment and discrimination which currently occur in educational settings. Schools must reconsider their approach to tackling all types of bullying, harassment and discrimination to make their schools safe spaces for all staff and all pupils. This downloadable free resource supports schools to change their approach to meeting the needs of ALL pupils to enact an educational cultural shift so that equality and diversity can thrive within the school environment. This resource helps schools to address issues surrounding homophobic bullying, it encourages pupils to think about their language and the way it may impact upon individuals who hear this type of language. This lesson asks pupils to consider others feelings and develop skills and qualities such as effective communication and empathy. It asks pupils how they can address homophobic bullying in their school environment. We can also deliver a workshop which encourages pupils to understand the impact of language, it explores homophobic bullying through interactive activities and encourages pupils to think about ways their schools could tackle bullying. Cost: £100 per one hour workshop. The ‘Gay Birmingham Back to Back’ project uncovered the hidden lives of LGBT people from Birmingham’s past. Researching as far back as the 1800s up until the 1970s. The project looked at the social, political and personal circumstances of LGBT people in these time periods. For these lessons we look at two time periods. Throughout the 1930s and 40s, individual wealthy, artistic, well educated, strong-willed women managed to live openly as lesbians because they were financially independent even though they battled against public disapproval. During the years of WWII, the freedom to explore lesbian lives was extended to women of all classes aided by the temporary absence of men and the increased geographical mobility of women engaged in war work. The return of men after 1945 pressured women into returning to a domestic, heterosexual lifestyle under the threat of confiscation of their children, with lesbians forced to live lives in which they repressed their sexuality and suffering agonies of guilt about their sexuality. This lesson explores the relationship between Annette and Rose and their love affair during World War Two. It asks pupils to consider the role of love in a relationship, it helps pupils to investigate the importance of morals, values and character and to evaluate the importance of personal relationships and to justify their reasons with well thought out answers. The late 1960s and early 1970s saw the development of second wave feminism, the women’s movement started in the twenties with the suffragette movement. Women campaigned to have the same equal rights as their male counterparts. For these women, while acknowledging that many inequalities were gender-related, there was also a need to work with men in order to promote change and social resolution. For others, (Radical Feminists) the oppression of women by men was deemed universal and supported other forms of oppression. For such women their interests were best pursued in women-only groups in the belief that the common interests of women outweighed any differences between them. For Black lesbians, however, the polarities were not so clear cut. This lesson explores the comparisons of growing up as a Black Lesbian or Bisexual woman in the 21st century compared to the 1970s. It explores the historical changes that have taken place in the LGBT community and the Black community during these two time periods. Leila and Fran present the information in their play in a lively and interactive manner. This lesson asks pupils to consider the ways rights have changed over time, it asks pupils to form opinions and to make decisions about their thoughts about equal rights. It is recognised that Personal Relationships are an important aspect of a young person’s development. This program develops young people’s knowledge and skills about relationships including the importance of language and communication, the value of friendships, the meaning of personal relationships and finally recognizing the difference between safe and unsafe relationships and ways to report unsafe relationships. We provide staff training around all of our resources and ways schools can teacher their students about equality and diversity. We provide assemblies for schools on anti-bullying and LGBT History Month. We have worked successfully with schools to deliver assemblies on anti-bullying and about LGBT History Month. Cost £35 for an assembly talk and lasts 20 minutes.